The CoolTouch VARIA laser machine is a versatile system that has been cleared by the FDA for podiatry uses, vascular treatments, fine lines, wrinkles and laser hair removal, plus it is currently being investigated for the treatment of onychomycosis. This long-pulsed system features a 1064 nm laser and a variable spot size from 2 mm to 10 mm. It also offers CoolTouch’s Thermal feedback system for additional safety. If you are looking to buy a pre-owned CoolTouch VARIA laser machine, SunrayLaser.com wants the chance to earn your business. That means we will provide a CoolTouch VARIA price quote with no obligation, and if you decide to buy we offer a full satisfaction guarantee with everything we sell. The CoolTouch VARIA laser system is one of the most affordable options available for a wide variety of cosmetic treatments, and it can be used with a standard 115 V outlet. That makes it easy to move between different treatment rooms without having to worry about power supply issues. 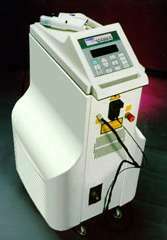 Contact us today for more information and a low price quote on used CoolTouch VARIA laser equipment. The CoolTouch VARIA system is safe, effective and easy to use. We have the CoolTouch VARIA laser system for sale at a price that is tough to beat, and we offer fast and friendly customer service to answer any questions you might have. Simply fill out the contact form below for more information or to request a no obligation CoolTouch VARIA price quote.